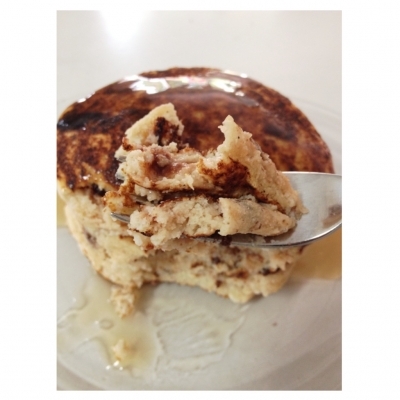 Super easy and filling protein pancakes made without protein powder! Perfect for any meal, pre or post workout. Chop up half of a Chocolate Brownie Quest Bar (or any other flavor) into little pieces (these will be the "chocolate chips"). Blend the rest of the ingredients in a blender and then fold the "chocolate chips" into the batter. Cook and enjoy! Makes 4 fluffy palm-sized pancakes.